I wish I could find the receipt for my Ravnica: City of Guilds pre-orders. When the set was released in September of 2005, I was starting my second year of college and my Magic career was in an awkward place. I was playing in very competitive Standard FNMs each week at Boston's now-defunct Your Move Games, but I was also still clinging to the belief that it was imperative to design as much of your own deck as possible. Mirrodin/Kamigawa Standard was coming to an end, so it was finally time to put down my snake tribal and Beacon blaster brews that had never quite done what I'd wanted them to. Ravnica was a new beginning-a chance to re-invent myself as forward-thinking deckbuilder on the cusp of great innovation. For the first time ever, I decided to buy as many cool unheralded rares as I could reasonably afford before the set actually hit store shelves. You can probably guess where this story is going. Shocklands? They were pre-selling for $20 each, so they were out of the question until I cracked enough packs. Dark Confidant? No chance-what if I flipped a giant monster at the wrong time? Life From The Loam? Chord of Calling? Remand? No, no, and no. I don't have the full list of playsets I pre-ordered, but I can remember most of them: Gleancrawler, Plague Boiler, Sunforger, Grave-Shell Scarab, Necroplasm, Flame Fusillade, Moonlight Bargain, Vinelasher Kudzu, and all five of the Hunted creatures. I'm pretty sure the average price I paid per card was around $3, which puts the total price of my pre-order around $150. I've made worse purchases in my long history as a speculator, but this might be the one I am most embarrassed about in retrospect. This is the kind of slow bleed pre-order purchase that newer and more causal players make all the time, and it's a great way to spend a lot of money on a pile of worthless cards. Keep that in mind the next time you're tempted by a small stack of low-price low-reward cards at the next set release. 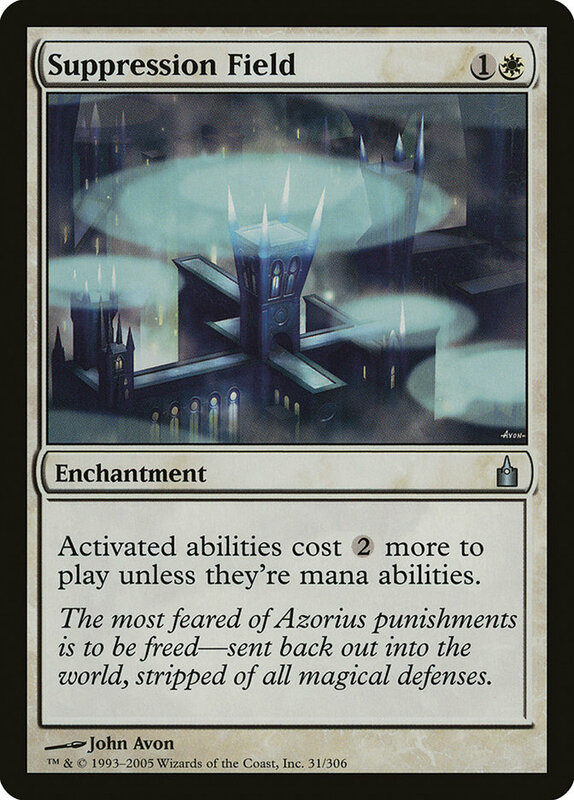 Despite that massive swing-and-a-miss, Ravnica: City of Guilds ended up being the first set in what is still my favorite block in the history of Magic. I've been waiting for this section of The Modern Series for months, and I'm excited to take this journey about nine years back in time with you. As a reminder, The Modern Series is designed to cover the key cards in each Modern-legal Magic expansion one at a time without being burdened by the latest trends. You can read my last entry, covering Saviors of Kamigawa, right here. Ravnica: City of Guilds was released in early October of 2005. Even though we get multicolor blocks every other year nowadays, Ravnica was the first set to emphasize gold cards since Invasion block five years earlier. Normal sets back then had fewer gold cards as well. 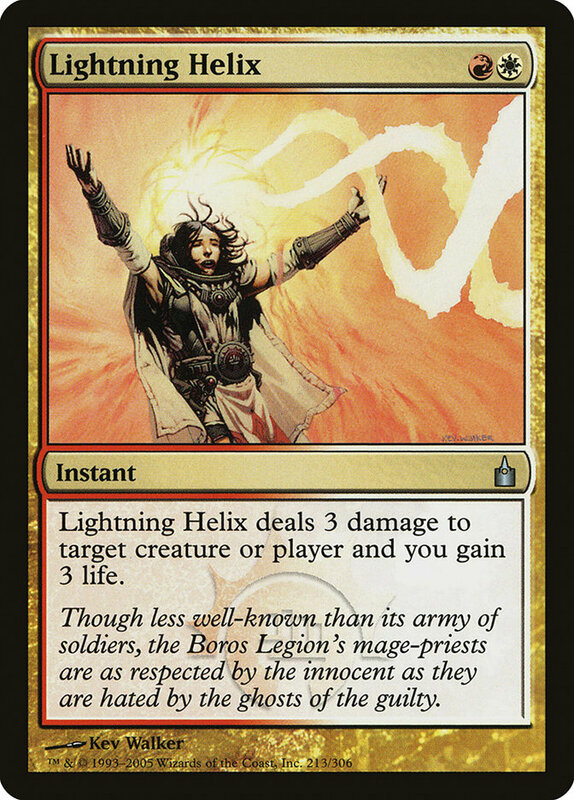 Remember how every set in Theros block had at least once cycle of multicolored things? The entirety of Kamigawa block had two, count 'em, two gold cards. That was it. To say people were excited about Ravnica is a massive understatement. 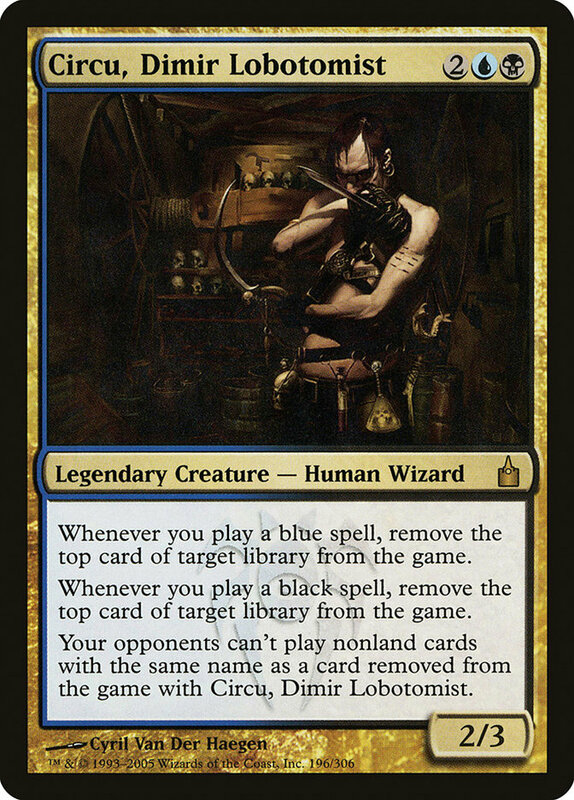 Ravnica's biggest contribution to the game was the creation of unique creative identities for each of the ten color combinations. Most Magic players like feeling connected to the world of the game, and the Ravnica guilds quickly became Magic's version of the Harry Potter houses. Instead of expressing your Magic identity as, "I am a blue mage because I like drawing cards," or "I am a green mage because I like big creatures," people latched onto the brutal efficiency of the Boros Legion, the mad creativity of the Izzet League, or the organizational prowess of the Azorius Senate. Ravnica also introduced hybrid mana, though it was limited to a small handful of underpowered cards. The first block in the set gave us just the first four guilds: Dimir, Selesnya, Boros, and Golgari. Each guild had its own keyword, though they didn't show up on nearly as high a percentage of cards as they did in Return to Ravnica. Boros had Radiance, which was mostly irrelevant in all formats. Selesnya had Convoke, which was strong in Draft (and gave us Chord of Calling for Constructed). Dimir had Transmute, which gave us Muddle the Mixture and, in a later set, Tolaria West. 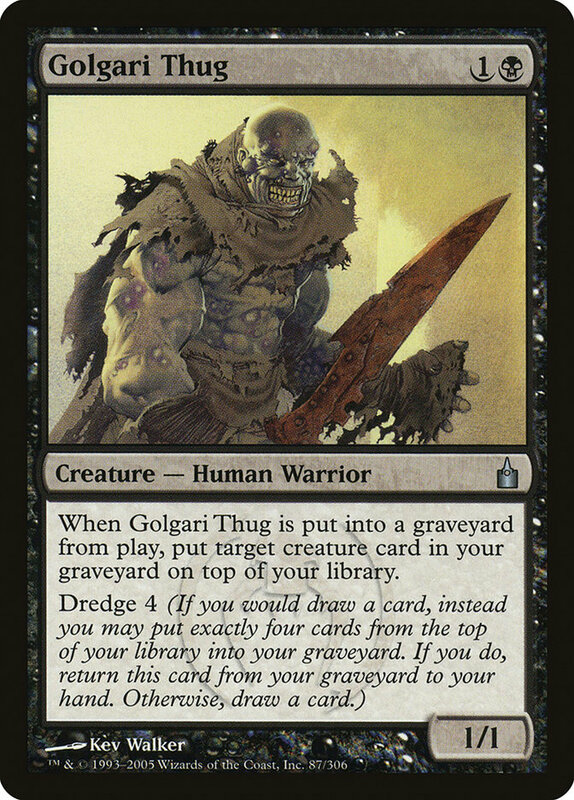 Golgari gave us Dredge, which spawned an entire Eternal archetype. Three hits and one miss-that's pretty good. The shocklands were popular from the moment they were spoiled, debuting close to $20 each and staying there for almost their entire run in Standard. Watery Grave is the cheapest of them now, but for years it was the most expensive of the four. Glimpse the Unthinkable, Circu, Dimir Lobotomist, and Dimir Doppelganger were the set's major chase cards at the Prerelease. In fact, many players believed that mill was about to become a major player in the tournament scene. All three of those cards pre-sold for at least $10 each. How popular was Dark Confidant at first? Try the 29th most popular rare . Eternal staples Hunted Troll and Master Warcraft both sold in far higher quantities. Dark Confidant actually stayed in the $5 range for years after that, never dominating Standard in the way it would eventually make an impact in Legacy and Modern. Ravnica: City of Guilds is generally considered to be a pantheon Limited set, discussed in the same terms as all-time Draft favorites Innistrad and Rise of the Eldrazi. Partly because of that, sealed product is very expensive. Sealed boxes generally sell in the $400-$500 range, though they were even more expensive a few years ago when shocklands were worth upwards of $40 each. While I can't endorse anyone spending $500 on a sealed box of Magic for the sake of drafting, anyone with a ton of spare cash should at least consider getting a box of each set in this block and hosting their own elite throwback Draft party. Just make sure you play with damage on the stack and mana burn-several of the set's commons and uncommons are powered down thanks to the game's current rules. Dark Confidant is the third most expensive card in Modern. Based on playability and scarcity alone, this should not be the case. Compared to format staples like Noble Hierarch and Tarmogoyf, Dark Confidant sees very little play in Magic's most popular Eternal format. Why is the price still so high? Most of it has to do with history and mystique-fewer cards exude power quite as much as Bob, after all. Another part is Legacy playability, where Dark Confidant shows up more often. If the drop-off in Dark Confidant's Modern popularity had happened recently, I'd be telling you to sell your copies before people realized that demand for this card doesn't measure up to the hype. That isn't the case though. In fact, Dark Confidant wasn't seeing much play in Modern back when the first Modern Masters set came out, and all that did was cause the price to go up. Heck, Dark Confidant is better-positioned right now than it was a month or two ago thanks to the Birthing Pod ban and the rise of Abzan as a dominant deck. While I can't recommend Bob as a buy until I see him start to perform better, he's always going to be a risk to hit Tarmogoyf numbers based on how the format shifts. Ultimately, I feel like if Dark Confidant were going to drop in price it would have happened by now. Instead, I'm holding my playset for the long haul. Might we eventually see enough top tier mill printed to make Glimpse the Unthinkable viable in Modern? We've got Mind Funeral, Archive Trap, and Breaking//Entering now, but it's still not enough to break past the occasional 8th place finish at a random SCG IQ. Glimpse the Unthinkable's price will remain almost exclusively tied to 60-card casual for the foreseeable future, where mill is on the Slivers/Elves/Dragons tier of popular strategies. Perhaps the most shocking thing to me about Glimpse the Unthinkable is that it hasn't been re-printed yet. 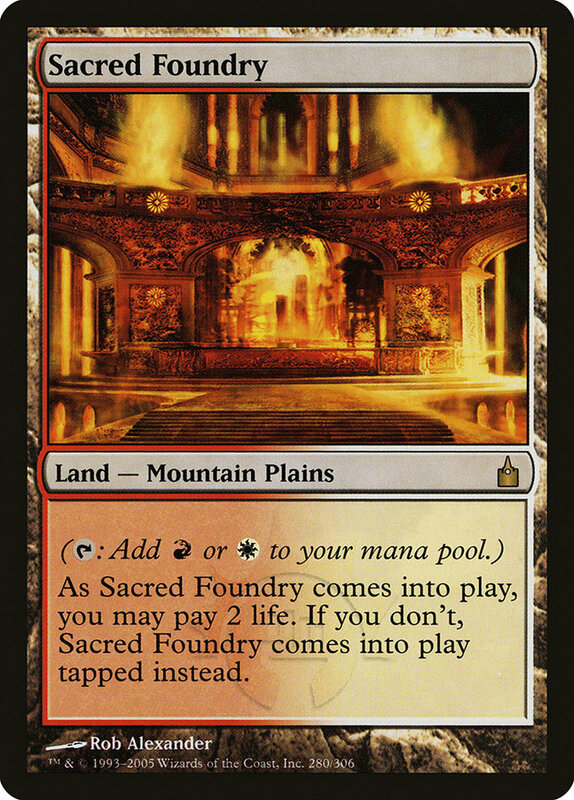 It's a simple card that can show up literally anywhere, and we've seen plenty of other mill cards come and go in the nine years since Ravnica was first printed. Glimpse has gone up in price by a buck or two every year since then, and that trend will probably continue until the inevitable reprint does come. Do you want to be holding the bag when it does though? I sure don't. The chances of this tanking due to a reprint feel much higher to me than mill becoming tournament viable, so I'm always happy to trade these away. Doubling Season bottomed out in the $18 range last summer. Since then, it's done nothing but climb in price. The Modern Masters and Judge foil printing are behind us now too, and it's very possible that this strictly casual card won't be printed again in Modern Masters 2015. In fact, finding copies of Doubling Season for the $25 retail price right now is quite difficult. The new value is likely going to be somewhere in the $30 range and climbing. If you want to buy Doubling Season right now, I highly recommend grabbing the judge foil. Is value is severely limited by the fact that the Modern Masters set foil uses the same art, but the judge foil does have rarity on its side, and there are quite a few copies left in stock at Star City for just $29.99. I expect normal versions of the card to be worth more than that before long, making the judge foil a solid buy at current retail. There is some risk in yet another reprint coming along, but we know it'll never be brought back in a Standard legal set, so the risk of this dropping by more than $5-$8 in one hit is unlikely. I like it as a long-term hold. Duel Decks: Jace vs. Vraska was supposed to increase the supply of Remands enough to keep this tournament staple well below $10. It worked, but not for very long. Remand is still a crucial card in Modern, seeing play in Scapeshift, U/R Delver, U/R Twin, U/R Control, Grixis Control, and nearly every Jeskai control or combo build. Splinter Twin's big win at the Pro Tour didn't help assuage demand, and Remand has jumped another 10% or so over the past few weeks as former Pod players flock toward blue. 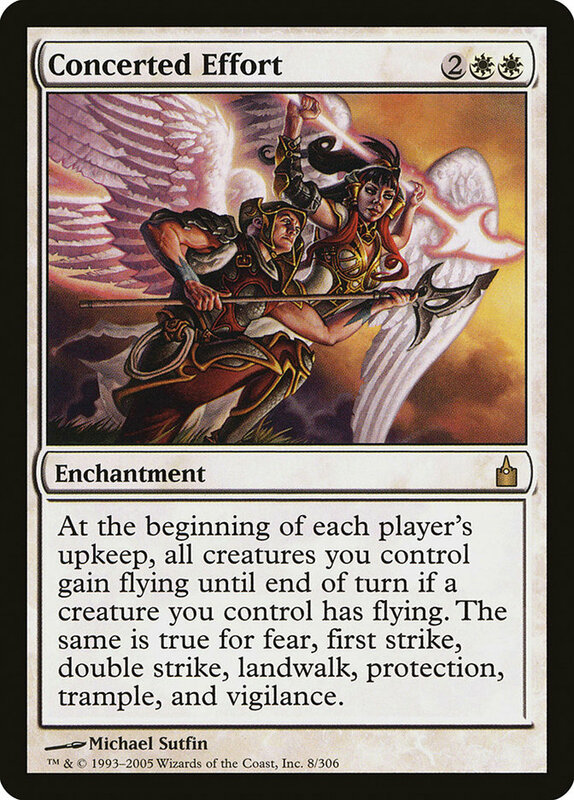 That all said, the odds of Remand being reprinted in Modern Masters 2015 have to be close to 90%, right? I certainly wouldn't take any action below that mark myself. If you have any of these lying around, sell them ASAP-supply should never be lower. The Return to Ravnica versions of these four shocklands are significantly cheaper, clocking in between $8.85 for Overgrown Tomb and $11.39 for Sacred Foundry. They're all still fine long-term holds, but their future prices depend more on the size of the player base going forward than anything else. The player base doubling every year in the Zendikar era is likely what lead to Misty Rainforest hitting $80, and it appears that game's growth since Return to Ravnica has been a great deal slower. The shocklands should keep going up if these trends continue, but their rise won't be all that fast. It's possible that something else will drive the price of these cards skyward-a new format, a dealer-lead buyout, some artificial hype, an increase in the number of active players entering Modern events-but I haven't seen any signs of any of that happening. For now, I'm still sitting on a few dozen of each shockland that I bought during set rotation. They'll go up in price eventually, but I can't see them hitting $20 each for at least another year or two. Privileged Position is another one of those purely casual cards that feels like it should have been reprinted at least once or twice by now. Enchantments have always been the hardest of Magic's permanents to casually kill, and I've made more than one Commander deck over the years where hiding all of my stuff behind a wall of shroud has kept me alive long enough to win. Having two of these out at once is pretty bonkers, but that requires a casual format without singleton rules and the desire to play multiple five-drops that don't impact the board. As far as competitive play goes, I've seen a few Enchantress lists that run this out of the sideboard. It's rare though. Privileged Position feels like it's somewhat protected from reprints because of its hybrid mana cost, but I could still see it come back in a Commander pre-con or in Modern Masters 2015. Regardless, the upside here is small, and the downside is that Privileged Position will be a $2-$3 rare when the inevitable reprint does come. If you have any extras, I'd sell them. You can pick up M15 versions of Chord of Calling for $3.79 here on Star City, and I doubt many people are going to pay almost $6 extra just to get the original version of this card. 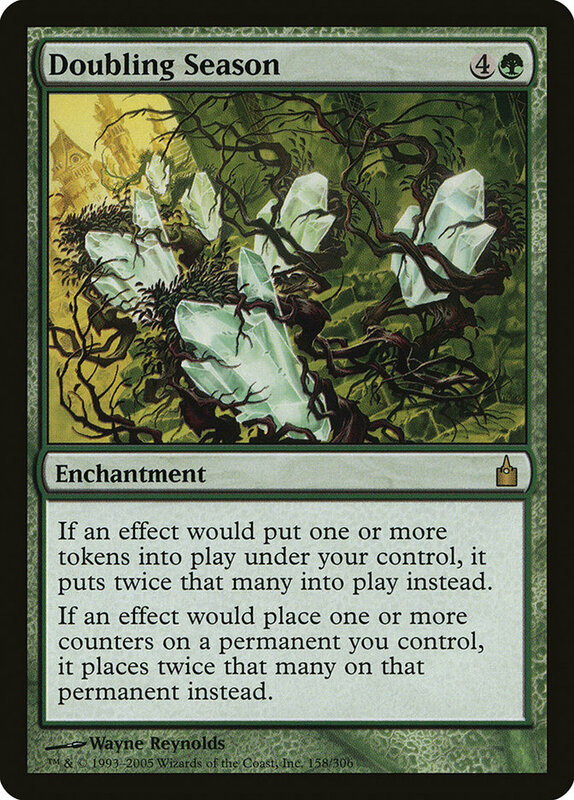 Chord of Calling is a popular long-term pick up in the finance community right now, and I can see why-it was worth six or seven times as much before the M15 printing, it probably won't show up again anytime soon, and marquee core set rares always have a ton of room to grow. That said, I'm slightly more skeptical about Chord of Calling's future. It was mostly a Commander card before Birthing Pod decks began dominating Modern, and I'm not sure that Chord has a solid home in Eternal play anymore. Casual value alone might buoy the price over time, but unless a new Modern deck comes along that can abuse this card, I can't see it gaining too much value. Worst case, you should be able to buy in a little cheaper during set rotation this summer. Many of the cards in Modern Dredge already spiked during the unbanning hype, so I can't recommend any of them as a spec. Vengevine, Grave-Troll, and Bloodghast are the three that should gain the most should it break out at a later date, and there's an uncommon I like that I'll mention later in this article. 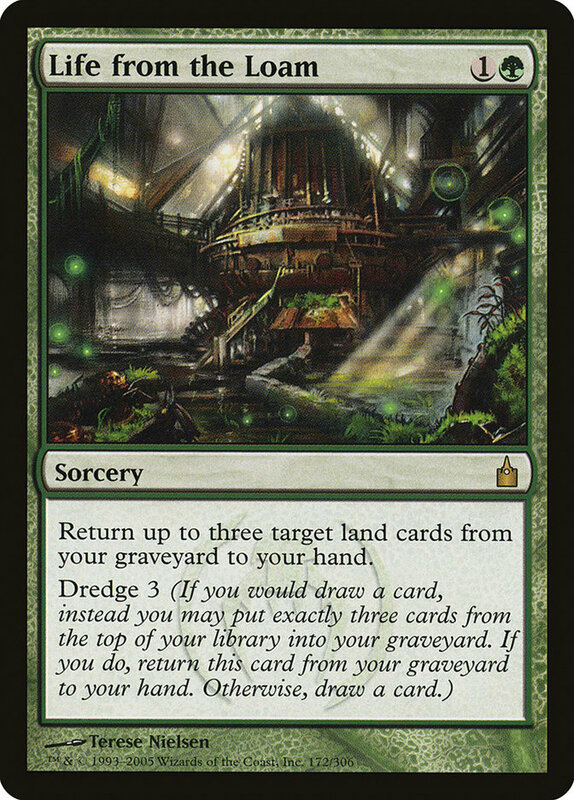 For now though, I recommend selling all of these cards and letting the dream of Modern Dredge live on in the minds of more risk-adverse folks. Combo Elves is one of the pillars of the Legacy format. With Glimpse of Nature banned in Modern though, the deck hasn't been able to make the transition. Many people (myself included) believed that the Beck half of Beck//Call would enable Elves to become at least a tier two strategy in Modern, but it just hasn't happened. It'll show up in a random event every once in a while, but it has yet to do well enough to gain traction. If Modern Elves does eventually make it, Cloudstone Curio might be the biggest financial gainer. It enables infinite mana with a Nettle Sentinel and a Heritage Druid, giving you an easy way to go off. The card has spiked a few times already-you can use the financial charts to see exactly when Curio was featured on camera during a Modern stream-but it's fallen off a bit each time when the deck eventually fails to make the top tables. Keep an eye on Curio for sure, but at this point I'm pretty sure WotC will have to print another Elves enabler or unban Glimpse of Nature in Modern to make this card a viable spec. Shadow of Doubt has been played out of the sideboard of control decks for years, mostly as a way to screw people out of their fetchland activations and steal wins against unsuspecting opponents. It found new life as an effective tool against Birthing Pod in Modern, drawing you an extra card while setting your opponent. Had Birthing Pod not been banned, I'd be hailing Shadow of Doubt as a great under-the-radar spec target. For now though, I'd expect it to fall back into obscurity. It might be a nice buy at some point in the future if it drops into the $2-$3 range, but if you can get close to retail for your copies now, you should trade them away. 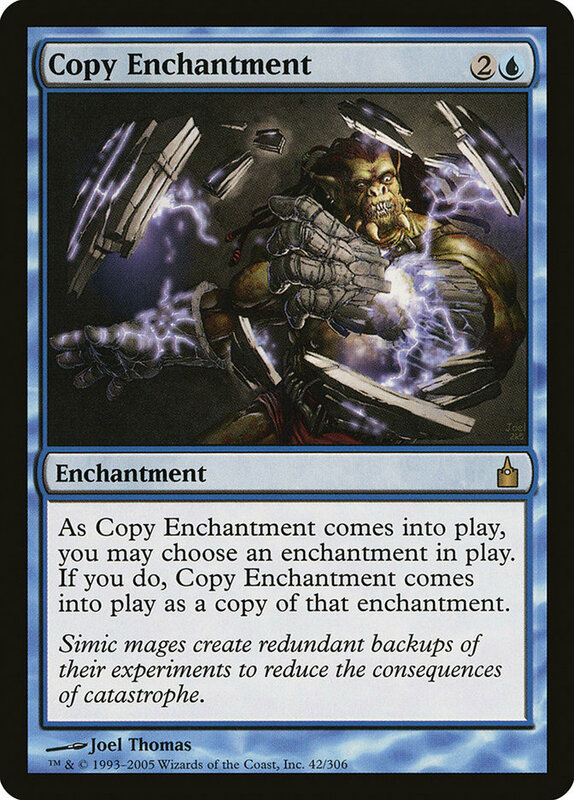 Copy Enchantment is an underrated Commander staple. 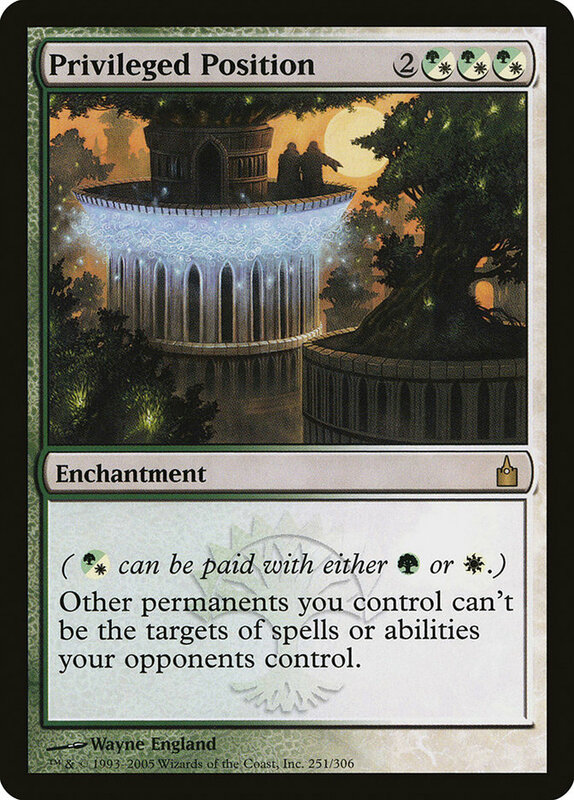 Most enchantments in that format are both expensive and powerful, and it's rare for Copy Enchantment to not have an excellent target in a multiplayer game. 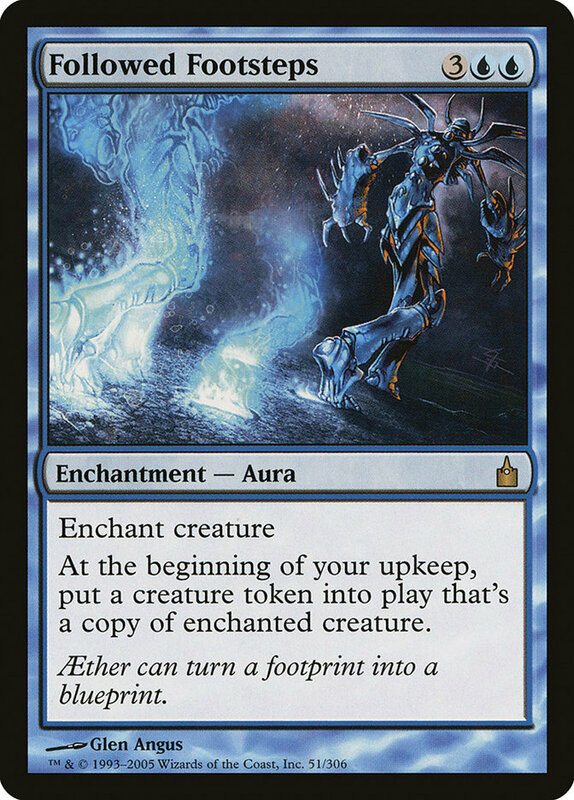 Much like Glimpse the Unthinkable though, Copy Enchantment is a very simple card that feels like it should have been reprinted by now. When that happens, we're looking at a $0.99 card. By the way, how nice does Clever Impersonator look as a long-term spec target? Current retail is just $3.29 and it's a far better casual card than Copy Enchantment. This is one of my favorite trade targets at the moment, and I'm always happy to grab them at market price. The last time we saw Birds of Paradise was way back in M12. 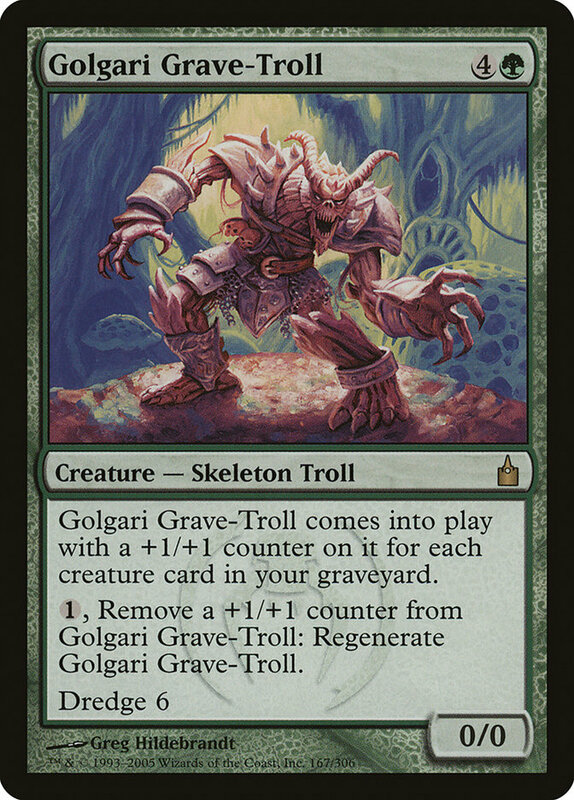 Has it been held out of the last three core sets to increase hype for its eventual return, or is one of Green's most iconic creatures finally considered overpowered in the modern game? 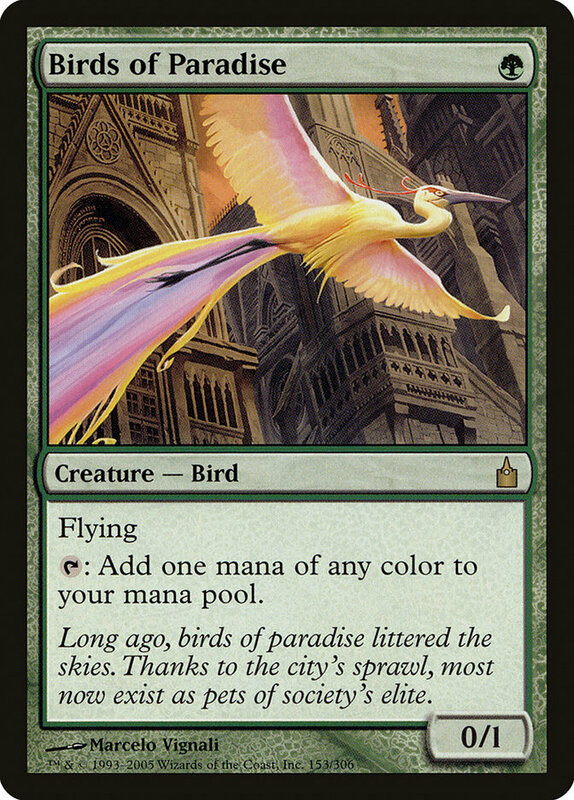 If it's the former, we should see Birds of Paradise dropping back toward $2-$3 again when the inevitable reprint does show up. If it's the latter, we'll be looking at a slow and steady climb toward $10 due to casual and Modern demand. I bet we'll see Birds of Paradise come back this summer for at least one more hurrah, so I'm not a buyer. If you think this is it, though you should probably grab a playset of these before too long. When I look at a card like this, I begin by reminding myself of the very real downside: if I plop Followed Footsteps down on my best creature and it gets killed right away, I end up getting two-for-one'd, and my life has suddenly become significantly worse. Of course, the Magical Christmasland possibilities are tantalizing: As long as I can make it back to my upkeep once, I'm getting a second copy of my biggest threat and everything after that is just gravy. Commander is all about potential upside for many players, and that's why Followed Footsteps is worth almost $5. This card leads to some pretty amazing stories, and they're often memorable enough to wipe away the memory of the 80% of the time when this just eats a removal spell. Followed Footsteps might never be a staple in competitive Commander, but it's a Timmy/Johnny MVP. Like most of the casual cards in this set, Followed Footsteps is a reprint away from bulk range, but this trades pretty well at $5 for now. If you've still got copies of this hiding in your bulk, it's time to change that. Life From The Loam sees fringe play in Modern, but it's a tier one Legacy staple that shows up in half a dozen different decks. Whether you're sacrificing lands to Zuran Orb, throwing them at your opponent with Seismic Assault, or re-buying a Wasteland, Life From The Loam does it all. Why is the price so low? It was reprinted twice in a row: first in Duel Decks: Izzet vs. Golgari and then in Modern Masters. 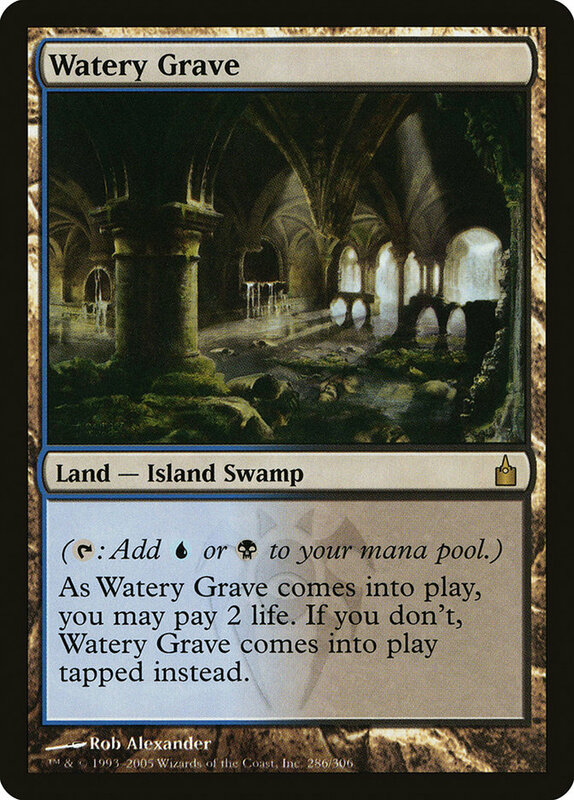 If Life from the Loam saw more play in Modern the price might have survived that much of a supply increase, but there are enough copies out there right now for everyone who plays Legacy. That said, there's some upside here thank to casual and potential Modern demand. 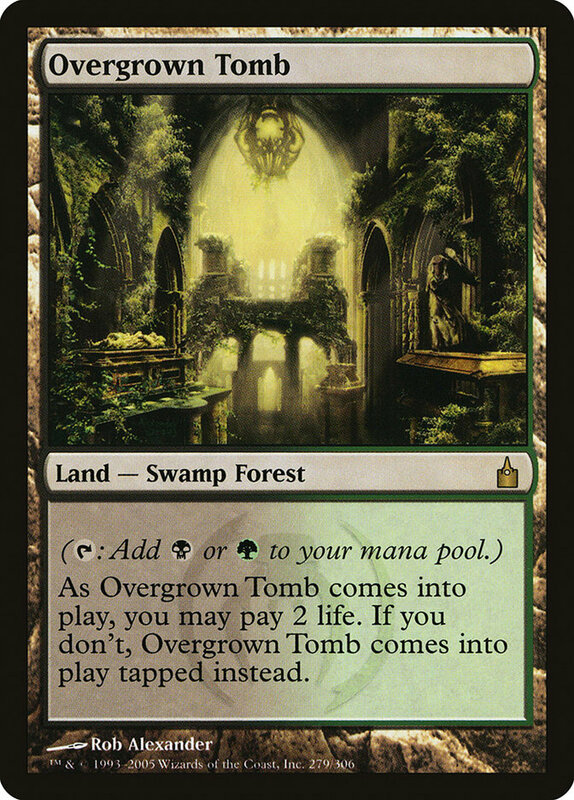 If Life from the Loam isn't in MM2015, we should see the price start to creep back up. I'm going to wait for the spoiler to come out, and I'll probably buy a set or two if it isn't being reprinted this year. 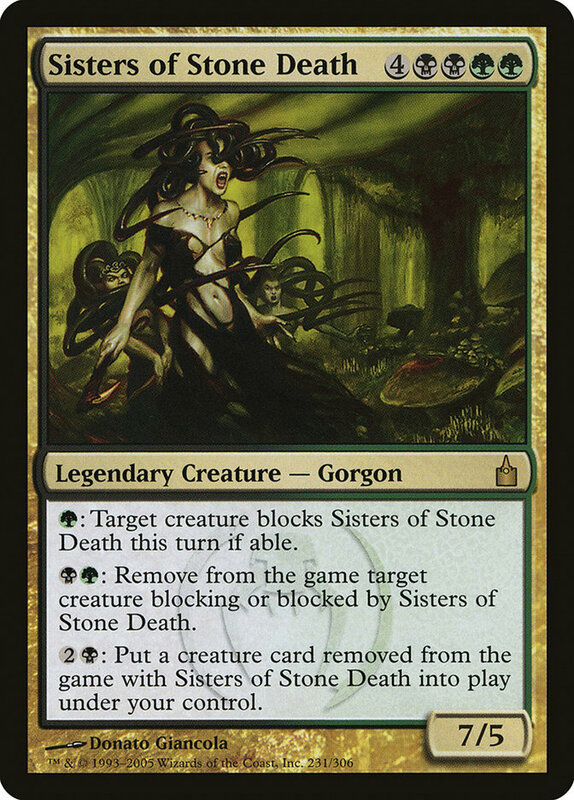 Golgari has no shortage of commanders, but Sisters of Stone Death is probably the most flavorful. Getting this into play is difficult, but once you do it can take over the game pretty easily. Even indestructible creatures aren't immune to the giant gorgon. We aren't going to see the Sisters come back in a Modern Masters or normal expansion, so the re-print danger mostly comes from Commander and duel deck pre-cons. Even still, there's no real reward for speculation on a narrow and hard to cast casual card. Give this one a pass. 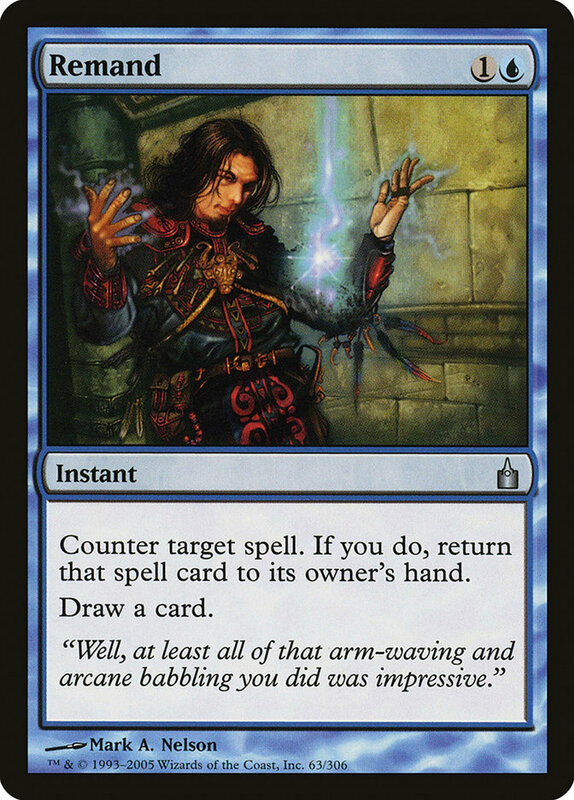 Circu, Dimir Lobotomist is one of those cards that would be close to $20 if more people played non-singleton forms of casual Magic. 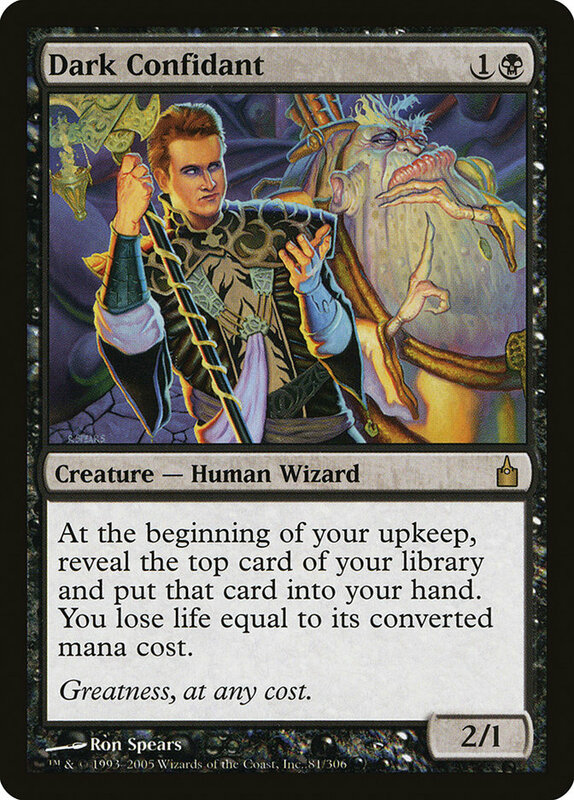 Circu is pretty close to worthless in Commander though, so his price tag is almost exclusively based on 60-card demand. Because of this, I doubt we'll see a Circu reprint-WotC rarely highlights casual cards that are bad in their flagship casual format. That makes Circu a pretty safe long-term hold. Of course, finding a buyer or trading partner once you're ready to sell is very difficult for cards that aren't relevant in Commander or any of the competitive formats. Most of the people who buy cards like this don't spend much time in game stores or playing in large events. Feel free to trade for these, but understand that you're probably going to have to buylist them in the end and plan accordingly. Counting all the promos and duel decks, Lightning Helix has been printed six different times. When Modern Masters 2015 comes out, it'll probably be printed for a seventh time. That's not the profile of a card I like to speculate on. Buying a set and holding onto them forever is fine, but beyond that you should be trading these away before MM15 spoiler season begins in earnest. 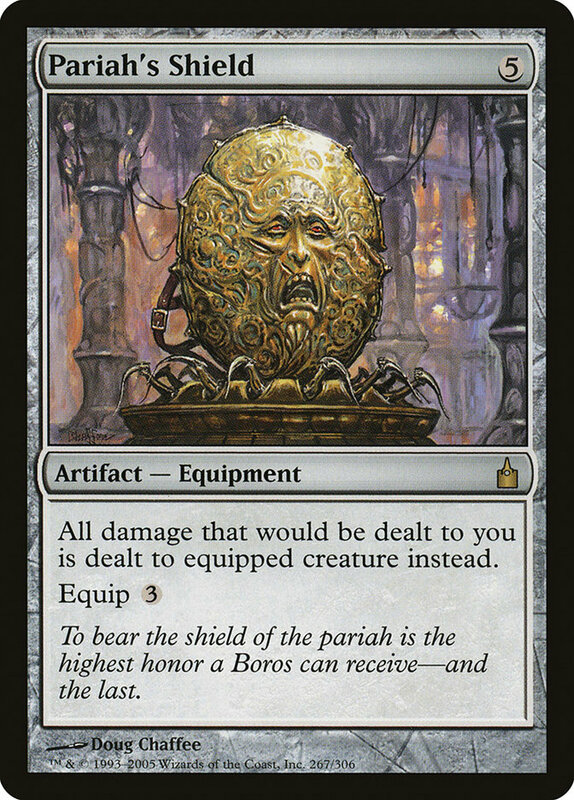 Pariah's Shield is fantastic if you're playing kitchen table Magic and you have a Stuffy Doll in play. Otherwise, it's far too slow and fragile to do much of anything. Pariah's Shield has value because it's a pretty unique card that looks unstoppable to a novice mage, making it somewhat of a trap for new players. Beyond that, it's binder filler that I'll generally buylist after a few months of stagnation and a lack of interest at my local shop. Concerted Effort kind of does everything while also kind of doing nothing. I prefer my expensive white enchantments to provide my army with a guaranteed boost-Cathar's Crusade, step right up!-but Concerted Effort is filled with enough tantalizing upside to make it really attractive to the right sort of player. This card has more real-world demand than Pariah's Shield, but you're still only going to be able to trade this to the most casual of deckbuilders. 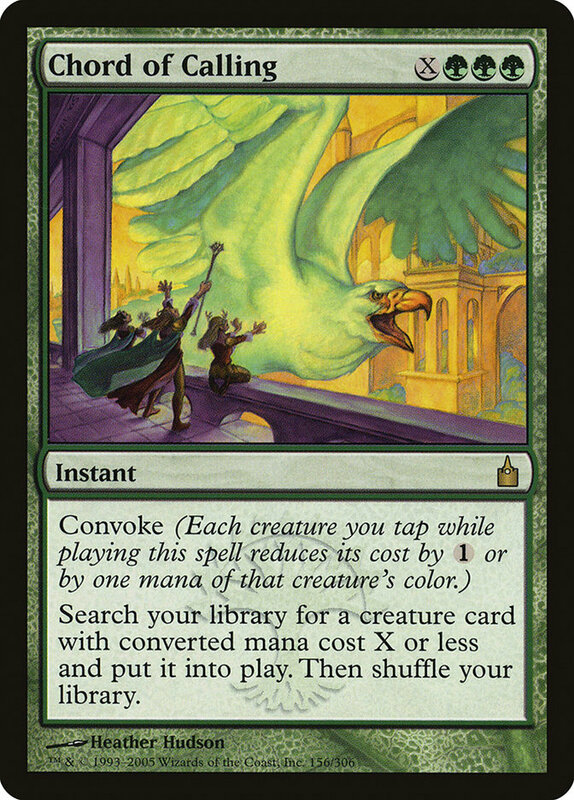 There might be an increase in demand for Concerted Effort if people decide to build a 60-card casual version of the Soulflayer/Chromanticore deck, but beyond that I can't see any reason why this card should gain value. In fact, I expect it to be reprinted at some point soon and the price should drop toward bulk soon after. Sell 'em if you've got 'em. Phytohydra is like an inverted Vigor, blocking forever while (in theory) building up into the kind of monster that can win the game on its own. It's more of a casual oddity than anything else though-you can't combo with it all that easily, it doesn't block fliers, and it still dies to both mass and targeted removal. For five mana, I need more than that in Commander. 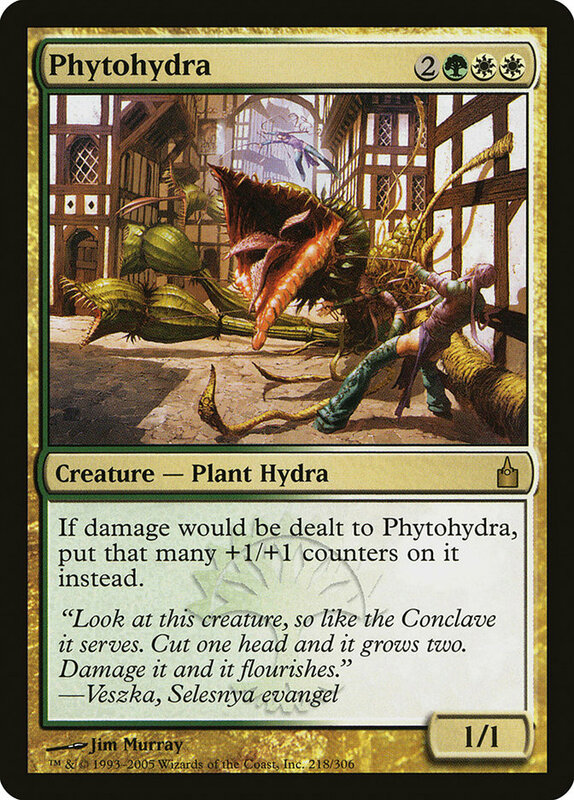 Much like Pariah's Shield, Phytohydra is a former bulk rare that has found enough interest among newer players to raise the price slightly over the past few years. Nothing interesting here for us speculators. Golgari Thug has long been a player in Legacy Dredge, and I've never been able to keep these in my trade binder for long. Demand is narrow, but it has been steady for long enough that it's hard to find Thugs for under $3 and nearly impossible to find them under $2. I can't see the price spiking due to Legacy demand alone though-not when Lion's Eye Diamond remains the deck's financial choke point. Golgari Thug becomes an intriguing spec option if Modern dredge ever takes off though. Were that to happen, I could see a $6-$8 price tag for Thugs within a matter of hours. I'm bearish on Modern Dredge and not betting on that happening, but it's worth keeping in mind if a big tournament breaks the right way. 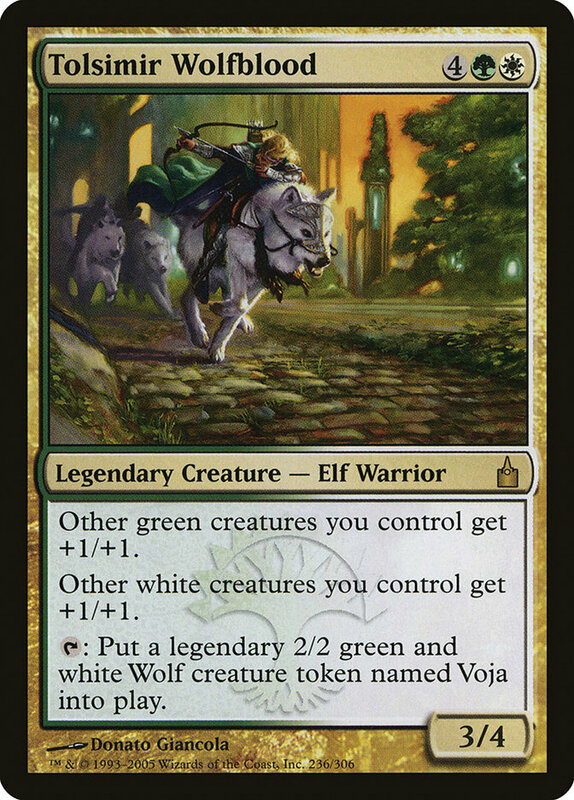 Tolsimir Wolfblood is a decent Selesnya-colored Commander. While paying six mana for a Glorious Anthem on legs isn't the best deal in town, the fact that Tolsimir occasionally double-pumps while giving you a free 4/4 to attack with every turn makes him both powerful and versatile. He's not good enough to see competitive play though, nor is he better than Rhys the Redeemed or Trostani, Selesnya's Voice in Commander. Original foils are cheap-and perhaps slightly undervalued-but non-foils are at risk of hitting bulk prices if there's ever a reprint or power creep for creatures keeps inching forward. You're telling me there wasn't room for a brew with four maindeck Torpor Orbs and four maindeck Hunted Horrors during the height of Birthing Pod's dominance? Travis Woo could have at least tried it out once or twice, right? Hunted Horror has long been about as close to broken as it's possible for a completely unplayable creature to get, and it's currently worth $2.35 mostly because there are people out there like me that want it to work. Hunted Horror is also not half bad in a multiplayer format where you can give the tokens to a nominal ally. I've heard some buzz about Hunted Horror in Tiny Leaders, but I have yet to see it actually work. It plays pretty well with other format staples like Ratchet Bomb, but I'm still not sure you can run this in a two-player format without having access to a lot of ways of dealing with the tokens very early in a game-difficult in a singleton format. 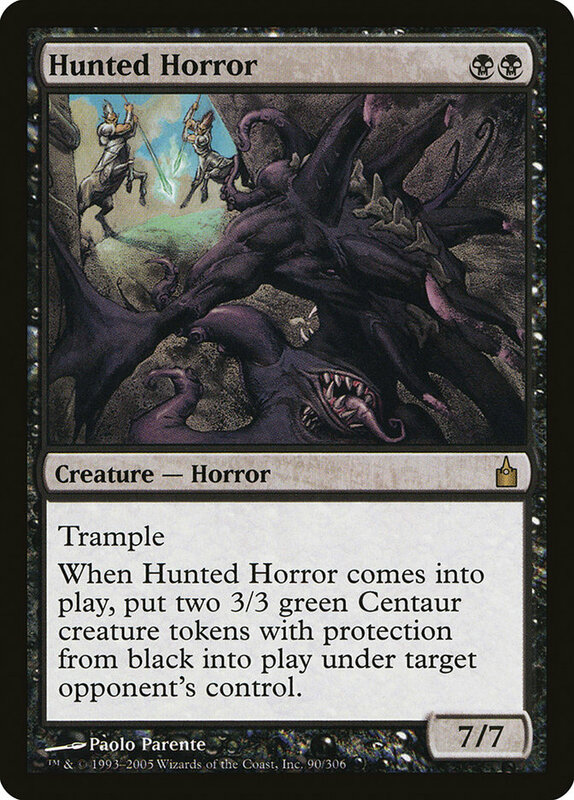 Hunted Horror is still worth considering as a potential Tiny Leaders breakout, I suppose, but at this point I need to see some results before I get excited. Suppression Field is standard sideboard tech for the Modern G/W Hexproof deck. Beyond that, it doesn't see much play in either casual or competitive Magic. Suppression Field is obscure enough to make a reprint unlikely, but it doesn't see enough play to make it a very interesting spec or an easy card to find a trade partner for. I generally buylist these whenever I come across them in collection bulk, and I doubt that'll change going forward. 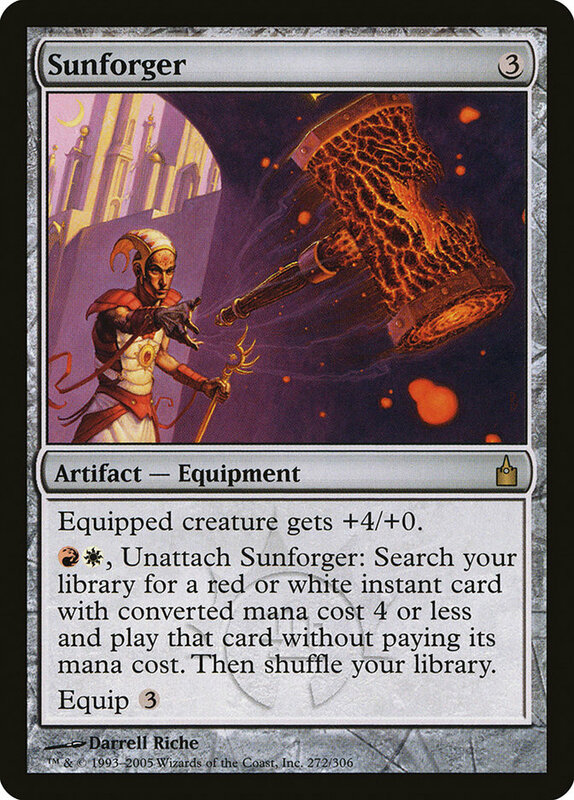 Sunforger was good in Standard, but it's always been too slow and clunky for the Eternal formats. I've heard some people hype it up as one of the best pieces of equipment in Tiny Leaders though, and I can certainly see it making an impact in Anax and Cymede or Alesha, Who Smiles At Death. Those two decks probably won't provide enough demand to drive the price up much, of course, but there's a little bit of potential here, especially for foil copies. Razia, Boros Archangel - $1.79 - Razia is quite expensive and isn't even close to the best Boros-colored legendary angel commander. She'll hold marginal value due to the fact that she's a cool angel, but if you're playing her, it's for flavor reasons alone. 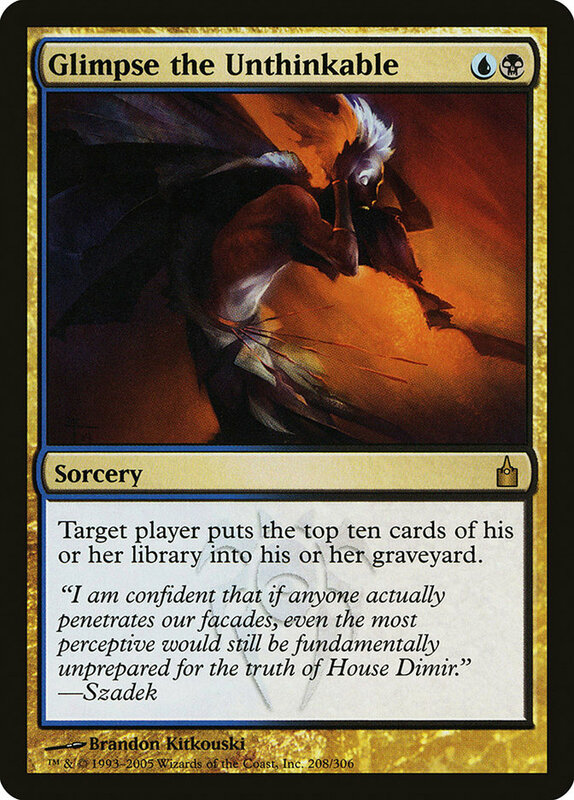 Dimir Doppelganger - $1.79 - Dimir Doppelganger was reprinted in Conspiracy, so you can get copies for $0.49 easily. Nothing to see here. Blazing Archon - $1.79 - Blazing Archon was a reanimation target in the Graveborn deck, so there's a fairly major reprint dragging its value down. This card was also much better before creatures hit their current power level, and there are better reanimation targets in today's game. Look elsewhere. Savra, Queen of the Golgari - $1.75 - Savra is an excellent commander, which is why foils are $15. Otherwise, she's too narrow to ever command much of a price. Darkblast - $1.35 - Darkblast is great in Modern against decks that want to run multiple Delver of Secrets and Young Pyromancers. The price spiked before the Treasure Cruise ban, hitting almost $3, but you can find copies for around $1 now without much trouble. The card has some potential still, but the metagame isn't as conducive to it now as it was a few months back. Twilight Drover - $1.35 - Twilight Drover is slow, even for Commander. It was also reprinted in Duel Decks: Sorin vs. Tibalt. No upside here. Tunnel Vision - $1.29 - Tunnel Vision can mill your opponent out in one shot, provided you know what card is at the bottom of their library and that they don't have any other copies of it in their deck. It's never going to do much of anything in tournament play, but it's solid in Commander mill. Its got its fans, but the application is narrow enough to keep the price down. Grozoth - $1.29 - The best thing that Grozoth does by far is tutor up a handful of Bringers for just three mana. You'd better believe I had a 60-card casual deck back in the day that did just that, and it was amazing. There's a chance this card randomly breaks out in the future if the right nine-drop is printed, but, well, you're still tutoring up a nine-drop. Not a gamble I'll be taking. Dimir Aqueduct - $1.29 - Dimir Aqueduct is the most expensive of the bouncelands right now, but they're all finally seeing a real push in value. Part of it is random Commander interest, but the Amulet Bloom combo deck is also driving demand for these cards. They haven't been reprinted since Planechase 2012, so we could see a brief window where they hit $2-$3 each before they're reprinted again. Time to pick them out of your bulk and put them in your binder. Helldozer - $1.15 - Helldozer isn't good enough to make the cut in my black-based Commander decks, though it usually ends up in my maybe-board and it can certainly do some damage when it hits the table. It's not bulk, but there's a reason it's never broken $2 either. Vulturous Zombie - $1.09 - Vulturous Zombie gets big in a hurry. Even with creatures being what they are today, this guy is worth running in most Golgari-colored Commander decks. It's been printed twice though, and it has no real applications beyond being a random midrange creature in a color pair that has a lot of them. Glare of Subdual - $1.05 - Glare of Subdual was fantastic in Standard back when it was legal, and Selesnya token decks generally want a copy in Commander. Beyond that, well, Glare of Subdual is no Opposition. I can't see it ever seeing competitive play again unless it's reprinted in a Standard legal set. - Dragons of Tarkir spoiler season has started! Next week will bring part one of my set review, and it's setting up to be an epic one. While I do like some of the cards that have been spoiled so far, I don't see any that make me want to run out and buy a playset at the current retail price. It's possible that the research I do between now and next weekend changes my mind, but right now I'm keeping my wallet tucked away. And yes, that includes Narset. - Shorecrasher Elemental caused a small spike in the price of Thassa and Master of Waves. Thassa is up to $9, and Master of Waves is sold out at $7. Of the two, I like Master of Waves more - it's a Modern playable card, and until last Friday evening you could find them for $3-$4. I'm not buying in at the inflated price though - there's no guarantee that blue devotion will return, and even if it does the deck will only be legal for a few months. - Tarmogoyf and Karn, Liberated were spoiled as mythics in Modern Masters 2015. Neither of these were unexpected, and I doubt either card will drop in price all that much. With $10 packs, Modern Masters 2015 mythics are still going to be pretty darn rare and expensive. - Flip cards are confirmed for Magic Origins! The planeswalkers are awesome, and it's likely that we'll get other double-sided cards as well. Anyone holding foil copies of Delver of Secrets should take note. - The fall set is confirmed as Battle For Zendikar. At long last, we're returning to world of Plated Geopedes and Vampire Nighthawks. While I'd guess that the chance of a Zendikar fetchland reprint is up around 75%, it's possible that WotC doesn't want all ten in Standard at once. Selling extras is fine, but I'd hate to sell the playset from my favorite Modern deck only to have to re-acquire them for double the price in a few months. At any rate, the price should remain reasonably high simply because people will need them between now and early October. - You know what card I love as a spec now that we know about Battle for Zendikar? See the Unwritten. We're 100% going to see new Eldrazi Titans this fall, and See the Unwritten is the best way to cheat them into play. This is going to be a deck. Get in now. - Flusterstorm spiked big this week. It was buyout related, but I don't see the price dropping any time soon. Mark Rosewater has said many times that storm is a perfect 10 on his 'storm scale' of mechanics we aren't likely to see again, and the card has already had a recent judge foil. While Flusterstorm is only legal in Vintage, Legacy, and casual play, it's important enough to those formats and scarce enough to justify a $60-$70 price tag. If you can find judge foils in that range, grab them quickly - that'll be the next thing to spike. - I can't resist trading for Snapcaster Mages and Eidolons of the Great Revel right now. Snappy has the look of a card that will be an easy $50 in a few months, and Eidolon of the Great Revel is undervalued based on supply even when you throw out Standard demand. - The hottest card in Standard right now is Ashiok. Even though it has uses in casual and Eternal play right now, I'm still selling into hype and buying at rotation in a few months. If you aren't using your copies right now, feel free to move them in the right deal. - Someone bought out all of the FNM promo Evolving Wilds and is trying to spike the price in advance of the card's new Standard legality. It should go up a little, but don't be the one going out and spending $20 on one of these. There's no way that price can even remotely hold. - Dragonlord's Servant is here, but it doesn't make Dragonspeaker Shaman obsolete. 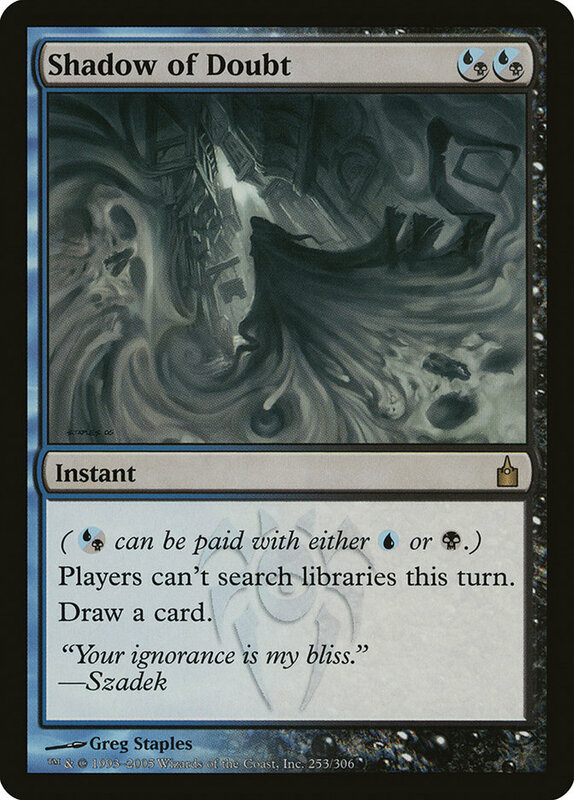 If anything, it makes the Scourge card more important because there's added redundancy across all the casual formats. I'm not speculating on these or anything, but if you know someone who wants to give you their shamans at a deep discount because of Dragonlord's Servant, it's worth it to try and swing a deal.